Laurier alumnus Shadrach Kabango (BBA ’05) has been named the full-time host of CBC Radio’s flagship show, Q. The Juno Award-winning rapper, better known as Shad, was named to the high-profile position following a weeklong guest hosting stint in January. 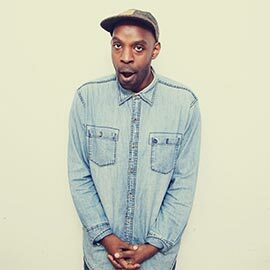 A three-time nominee for the prestigious Polaris Music Prize, Shad has been a guest and performer on Q multiple times. During his time as the show’s guest host he interviewed the likes of actress Evangeline Lilly, opera star Christine Goerke, and filmmaker and author Miranda July. During his time studying in Laurier’s business program, Shad was working on his budding rap career, performing and writing songs. He recorded his first album, When This is Over, in 2004 while in his final year at Laurier after winning a cash prize at a local talent competition. Shad’s second album, The Old Prince, earned him his first Juno nomination and appearance on the Polaris Prize shortlist. In 2010, he won the Juno Award for Rap Recording of the Year for his third album, TSOL, beating out international star Drake. Shad’s 2013 album Flying Colours was also nominated for a Juno Award. In 2011, Shad was named one of Laurier’s 100 Alumni of Achievement, a list of exceptional alumni the university compiled to celebrate its centennial year.